This year I participated in the very first Great Food Blogger Cookie Swap. I'd like to thank the masterminds behind this huge undertaking, Lindsey from Love and Olive Oil and Julie from The Little Kitchen. I can't imagine organizing something of this magnitude and they did an awesome job. Thanks girls!! For the cookie swap, I wanted to do a cookie that was simple, traditional and easily transported. 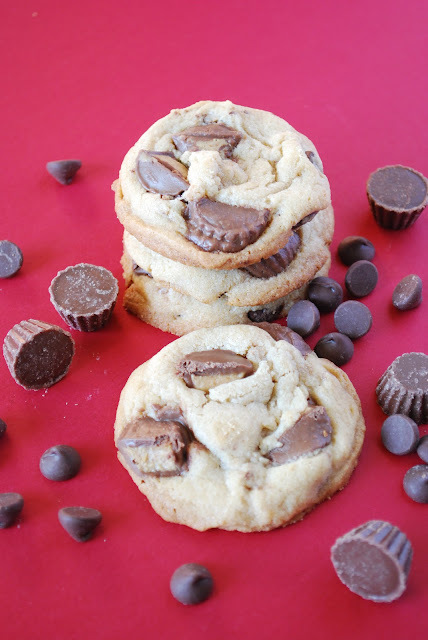 A few weeks earlier, I attempted to make Recipe Girl's Reese's Stuffed Peanut Butter Chocolate Chip Cookies. I had problems with the 'stuffing' part. I decided just to bake the remaining dough without the Reese's cups and the cookies were still delicious. However, for the cookie swap, I wanted to incorporate the peanut butter cups in the cookie. I added the mini Reese's cups to the cookie dough and that did the trick. Peanut butter and chocolate is one of those flavor combos that you just can't beat. I received some wonderful cookies as well. I received delicious Chocolate Peanut Butter Pretzel Cookies from Currently Coveting and wonderful Gingerbread Latte Cookies from Southern Charm. *Update* - I also received some very tasty Cinnamon Pecan Peanut Butter Oatmeal Cookies from The Toasted Sprinkle. Preheat oven to 350 degrees. Line baking sheets with parchment paper or silpats. In a medium bowl, mix together flour, baking powder, baking soda and salt until combined. Set aside. In a large bowl of an electric mixer, cream together butter, peanut butter, white sugar, and brown sugar. Add the egg and mix until combined. Mix until fluffy and light, around 3 minutes. Then add dry mixture to wet mixture. Stir together just until the dry ingredients are incorporated. Stir in 1 cup of chocolate chips and 1 cup of the mini peanut butter cups. Using a cookie scoop, place dough balls on lined cookie sheet and bake for 8-10 minutes or until the cookies are light brown. I think I was your 3rd swapper, did never receive them? How sad! I wonder what happened. I guess I should have gotten a tracking number after all :( Perhaps I will make another batch and send them out. So sorry! yum, these look delicious! sounds like you received some fantastic cookies as well! I love the big chunks of peanut butter cups in these! These look fantastic! Look at those big chunks of reese's cups! You're right about the chocolate/peanut butter combo...classic and delicious! Amazing cookies!! I saw these on pinterst earlier today, and pinned them already! They look awesome! These look straight up good! Butter and decadent! YUM!